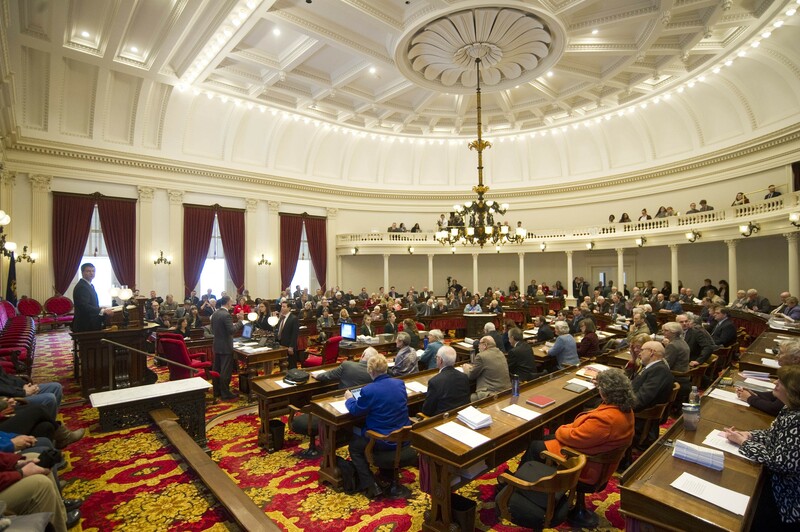 Democratic leaders of the Vermont House sought to quash a resolution Friday calling on Gov. Peter Shumlin to publicly release emails his legal counsel attempted to delete. The non-binding measure, sponsored by Rep. Chris Pearson (P-Burlington), asks the administration to hand over email accounts belonging to five former Shumlin staff members who left state employ more than three years ago. Shumlin’s lawyer, Sarah London, asked a state information technology officer earlier this month to delete the accounts as part of its archiving process. Critics have questioned whether her request was prompted by a looming crackdown on two politically connected Northeast Kingdom developers — a charge the administration has repeatedly denied. Speaking on the House floor Friday afternoon, Pearson argued that the Shumlin administration could easily restore trust by handing over the emails. Rep. Willem Jewett (D-Ripton), vice chair of the House Judiciary Committee and a former majority leader, disagreed. He said that Pearson’s request could interfere with ongoing federal and state enforcement actions against the developers, Ariel Quiros and Bill Stenger, who have been accused of fraud. To that end, Jewett introduced his own resolution, which he hoped to substitute for Pearson’s. Rather than explicitly call for the release of the documents, Jewett’s resolution urges Attorney General Bill Sorrell to determine which records “should lawfully be withheld and which should be publicly released in response to a public records request.” It also expresses support for Sorrell’s investigation and urges the administration to “promptly respond” to public records requests. As the House debated the competing resolutions, Shumlin spokesman Scott Coriell took to Twitter to lambaste Pearson — and the legislature. Coriell’s tweets quickly made their way into the debate. The debate made strange bedfellows. Two prominent Republicans, Wright and Rep. Anne Donahue (R-Northfield), joined left-leaning independent Rep. Paul Poirier (I-Barre City) and right-leaning Democratic Rep. Cynthia Browning (D-Arlington) arguing in favor of Pearson’s resolution. But the leaders of both the House Democratic and Republican caucuses, Rep. Sarah Copeland Hanzas (D-Bradford) and Rep. Don Turner (R-Milton), sided with Jewett. After 40 minutes of debate, House members appeared to be getting restless. Noting that the Passover holiday was approaching, Wright moved to delay a roll-call vote on the substitution request until Tuesday.